D.O.A. (1950), a film noir drama film directed by Rudolph Maté, is considered a classic of the genre. The frantically paced plot revolves around a doomed man’s quest to find out who has poisoned him, and why. 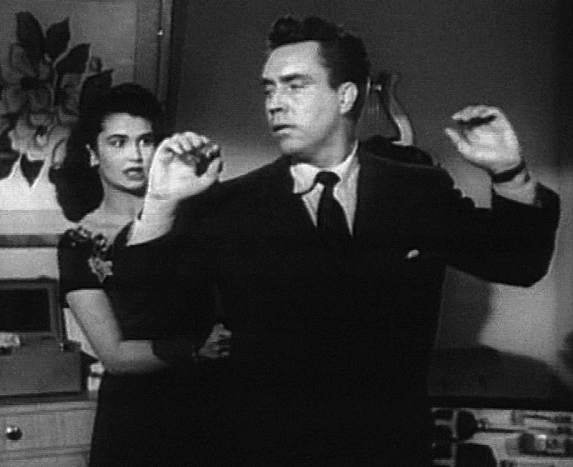 The film stars Edmond O’Brien and Pamela Britton. Leo C. Popkin produced D.O.A. for his short-lived Cardinal Pictures, but failed to renew the copyright in 1977, so that it has fallen into the public domain. The film begins with what a BBC reviewer called “perhaps one of cinema’s most innovative opening sequences.” The scene is a long, behind-the-back tracking sequence featuring Frank Bigelow (Edmond O’Brien) walking through the hallway of a police station to report his own murder. Oddly, the police almost seem to have been expecting him and already know who he is. A flashback begins with Bigelow in his hometown of Banning, California, where he is an accountant and notary public. He decides to take a one-week vacation in San Francisco, but this does not sit well with Paula Gibson (Pamela Britton), his confidential secretary and girlfriend, as he does not want her to accompany him.